This field-tested, six-day curriculum responds to community development program managers’ and planners’ need for a practical behavioral framework that strategically aids them in planning for maximum effectiveness. The DBC Framework was developed from the earlier BEHAVE Framework (developed by AED) by members of CORE Group’s Social and Behavior Change (SBC) Working Group and the Food Security and Nutrition Network SBC Task Force. The curriculum enables private voluntary organizations (PVOs) and partners to replicate the DBC workshops conducted with food security practitioners and CORE Group members in multiple countries and regions around the globe. The resource is designed to help train participants to apply the DBC Framework to improve development programming. It combines handouts and facilitator materials with easy-to-use training guidelines. 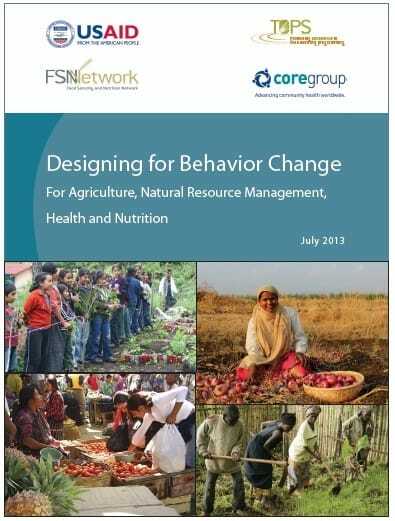 This tool also helps practitioners to respond to FFP’s new RFA guidance on identification of behavioral determinants and creation of a behavior change strategy in their programs. View the document in additional languages here.